Unfortunately, it was used to belittle many, by so-called “serious” photographers. To them, if you chimped you screamed, “I don't know what I'm doing.” It was nonsense, of course, but articles written about chimping in those early years were almost universally negative. Even those who only occasionally chimped were mocked. It was a shame that the term was disparaging because many photographers who could have benefited from digital cameras' image review feature avoided it, merely because they might look amateurish to those around them. Chimping after every image is made can be a detriment, but as a tool in a photographer's overall arsenal, when needed, it can be highly beneficial. Before discussing how chimping can be beneficial, it's important to learn why and when chimping should be avoided. • If photographers review their images too often or at the wrong time, they can miss great photo opportunities by having their head down reviewing photos instead of watching the scene unfold in front of them. For example, if you're doing street, event, sports or wildlife photography, you must judiciously review your images or likely miss a great shot as the scene in front of you changes from moment to moment. • It takes significant power to run the monitor display. Relentless image reviews can deplete a camera's battery quickly. Never set your camera to display your images on the monitor after every shot. • There is often a significant difference between how an image looks on a camera's small monitor versus a large computer screen, especially when you're trying to determine how well the image is focused. There are two ways to improve an image review's focus accuracy. Use can use the display's zoom feature to enlarge its details or better yet, use a loupe to magnify the image displayed on the camera's monitor. I recommend HoodLoupes. I've had one in my photo gear kit for years. 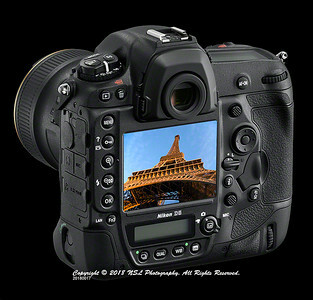 • Making a judgment to keep or discard an image based solely on its display on your camera's monitor is often a mistake. Often, their appearance can be worse and sometimes better, when displayed on a large computer screen for editing. Moreover, images that don't look particularly wonderful on a camera's display may in fact be great after postprocessing is complete. Now let's discuss how chimping can help photographers. • When shooting conditions are difficult, requiring you to manually override exposure settings suggested by your light meter, reviewing images on the camera's display to help ensure your override has worked is a great use of chimping. For example, zeroing in to the best exposure to capture a bird in flight can take multiple adjustments until you have the optimal exposure. When chimping, don't miss using the histogram feature built into your camera's display. The histogram displayed on your screen can help you quickly zero into an optimal exposure. For example, the histogram can tell you if your image's highlights are blown out, resulting in a loss of detail. It will give you a more accurate read on your exposure than merely chimping with blinkies (flashing highlights) to show you where highlights are likely blown-out. I never turn blinkies on. The histogram is much more useful. • Sometimes, while setting up for an outdoor photo session, especially as night falls, it's hard to tell if your photos might include distracting elements such as a tree branch or a vertical object “growing” out of someone's head. Chimping to assure you have a “clean” image is a great idea. • When you're in the midst of rapidly changing lighting conditions, chimping can help you be sure you're properly adjusting your exposure. • When you're trying to get a particular effect in your images, such as when motion is involved, chimping can give you insight into how well you did and if you need to make more adjustments. It can help you see if you froze your subject's movement, kept your camera moving tightly with your subject while panning or if you allowed enough time for a long exposure to get the image's appearance just right. So … to chimp or not to chimp? I never worry about what someone else thinks of chimping. I chimp whenever I believe it will be beneficial in getting the best possible image of my subject, but I'm prudent about when I chimp to not miss a great photo opportunity. You've freed me Ned. I won't be self-conscious again when chimping. Thanks. Thanks for the article. I sent a link to our photo club. I want the old timers to read it. They are so obnoxious when someone dares to look at a photo they just made. As a result more than a few learning photographers are missing great lessons and great photos they could have had. Jane, I use chimping as a tool during workshops to help new and even experience photographers learn about steps to take during difficult lighting situations. I have seen continued resistance from a tiny percentage of old-timers, but then again, they switched to digital from film, kicking and screaming the whole way. More than a few continue to claim that film images are far superior to digital, sometimes even when they can't tell the difference in a print or two.